Digital photography was a centerpiece topic at Macworld SF. In this podcast, I review the trends and conversations I experienced while teaching at the event, and when talking with other photographers. I learned a great deal about what to expect in the coming months, and share that in this broadcast. 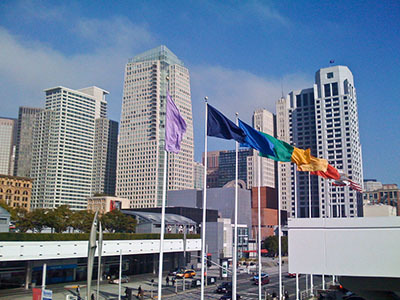 Photo of Moscone Center by Derrick Story, captured with an iPhone. About Face is the January 2009 Photo Assignment. Think about creative ways to make a portrait. It doesn't always have to be the "smiling into the camera" composition. You can read more about how to submit on our Submissions page. Deadline for entry is Jan. 31, 2009. Learn what photographers need to know to organize and edit their images with Photoshop CS4. 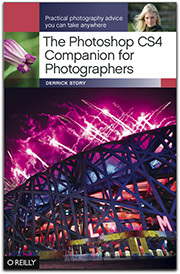 Take a look at The Photoshop CS4 Companion for Photographers. It fits in your laptop bag and is very easy on your wallet. I just listened to the podcast. As an Aperture user for my personal and freelance photo work, I totally agree with you about CS4 not really being necessary for the little bit of work that I end up in Photoshop for. But at work I am totally loving CS4. As a designer I love the "birds eye view", multiple tabs in one window, content aware scaling, etc. I am lucky enough to work for an amazing media company who upgraded right away and I am currently running CS4 at work and on my laptop but still using CS3 Master Collection at home. Those two words "Master Collection" are the reason for me not upgrading at home. Since I work with everything in Master Collection, I will most likely upgrade with the next version of CS (CS5?) due to the cost associated with doing so. Just like you said, if I wasn't working with Aperture and was doing all of my editing with photoshop, I would definitely be more interested in upgrading at home. I have heard people at Adobe say that they don't feel Lightroom will interfere with Photoshop sales. I feel like that has already been proven wrong in this example... at least in this economy. Things would be possibly be different if people weren't as worried about spending money but at this point I think it is definitely interfering. Most enthusiast would have previously gone after Photoshop or Photoshop elements but now they can get away with just Lightroom or Aperture until they get more serious. Even as a serious photog, I find myself more willing to brighten and sharpen eyes with the dodge/burn plug-in included with Aperture than I am to open something in photoshop... depending on the level of the project. It was nice to hear your review of the photo management options. As always, I was impressed with your integrity in outlining the pros and cons of each option. I feel like you really make an effort to give us unbiased information. Thank you.